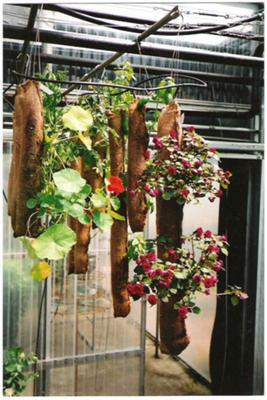 Here's a tip on how to convert basic jute and coconut strips into an amazing vertical garden design. 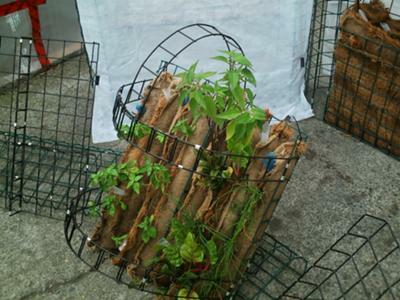 Convert recycled coffee bags or burlap cloth from the garden store into 2 or 3 foot strips, cut into 12 inch(30cm) wide strips. Same for the coconut fiber, which is used as an inner liner. Begin by overlapping equal lengths and widths of jute & coconut fiber strips. Place the strips, jute strip on bottom, into a half-pipe container(the tube-shaping jig). That is, cut a 3 or 4 inch diameter pvc or cardboard tube in half lengthwise (one to three feet long is sufficient) to create a half-pipe jig that holds the two-strip casing during the loading process. This is the beginning of creating a tubular sleeve out of the jute and coco casing materials that I call a biorope. Once the strips are inserted into the jig, close the ends with a few snugly squeezed staples to make like a canoe shape. I use a warehouse stapler from work but even sewing the ends works too. Now we can begin to load the canoe with a quality soil blend, a lightweight mixture including a bit of sand, some compost, some coco powder and perlite or vermiculite to maximize aeration and don't forget to put in soil nutrients and fertilizer in small amounts since we are creating a micro environment to last one or two cycles before being refurbished. With the canoe in the jig and the ends stapled close, it is time to load with soil, seed and transplants. Take a scoop of soil and place it in the middle of the canoe. Take another scoop and slide it into the ends to form a slightly compact pocket. The tube shape is beginning to form. Fill the canoe to within an inch from the top of the strips (or less). Leave enough room to pull the fabric top-sides together creating a seam lengthwise along the canoe. Now the biorope comes into its true form when the top-sides are stapled at three inch intervals. Leave room between staples to access inside the canoe to place the seed or transplant. Pull the top-sides together as you staple to create a snug enclosure, kind of like how a sock feels on your feet. Overfilling the canoe with soil may make this part tricky so remove some soil if necessary. Now that the canoe is loaded with soil, seed materials and a tight seam along the length, the biorope is ready to be hung from the end with a zap strap or wire. 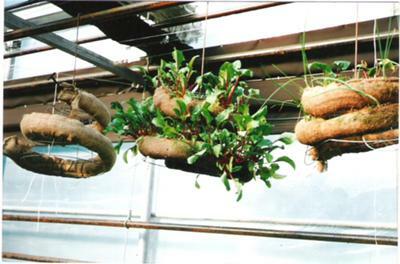 It can alternatively be placed horizontally for plants having small root ball sizes. It is also acceptable to bury the biorope into your garden row. The roots will grow into the ground yet the inner core remains protected during excess rains or dry periods. For watering the biorope, simply pour or spray along the seams, opening up slightly to allow access. A water cone can be used to simplify matters. Insert a cone every foot or two. To test for moisture levels place a finger between the seam to feel midway for moisture or dryness. I have even watered my short biorope in the sink or a shallow tray. A five gallon bucket is great for dunking half way then reversing the ends, let drip till it stops then re hang. The biorope will quickly soak up the water and hold. The coco fiber works good to hold moisture. If I am buying bagged soil I look for the brand that includes hydro gels or wetting agents in their soil mix. 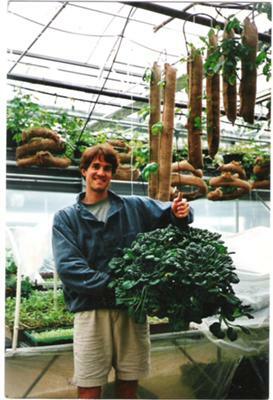 The biorope is a single cycle idea so when the harvesting is over, simply open up the seam and shake out the old soil. The coconut strip can be reused, usually without worry of cross contamination. The jute or burlap strip biodegrades naturally and is easily replaced when necessary. Using the tube-shaping jig once again, refill with soil and seed, close the seam and re-install the biorope for another season. I have enjoyed using this technique for a few years and much prefer it to conventional gardening. I have experimented with salad greens, strawberries and tomatoes. Even potatoes, carrots and beets do well in biorope using a wider diameter and lengthening it to create more space for roots. It may take some close observation of the moisture levels before getting used to a watering routine. Once in synch though, you'll see how efficient the biorope can be with water consumption. Create the 'sponge-effect' to keep the soil moist at 70%. Excess water is readily removed through the coconut liner and protects the soil from soaking. Try going year round using this method as it worked for me using hardy plant varieties like spinach, kale, etc. see my blog for pics and style ideas. I use this technique in a food security project I recently started called 'Gardeners Without Borders' and have even taught this gardening method to blind people, children, seniors and chef's.